Raphael easel, made of beautiful elm, and a unique functional design that allows the user to bring the artwork (center-mast with top & bottom canvas-holders)below the table surface level, allowing the artist to sit while working on the top of the canvas. 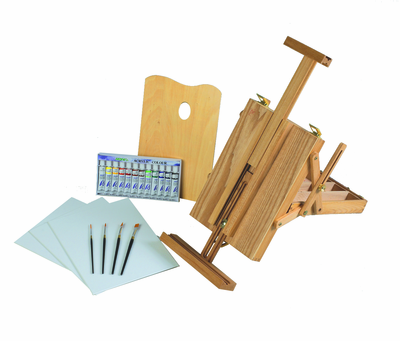 The easel is also equipped with storage compartments for all materials. Kit also includes: 12-tubes of watercolors, 1 8x10" w/c pad (24 sheets) and 4 assorted taklon artist brushes, all in a full color box.